Elephant in the camp! 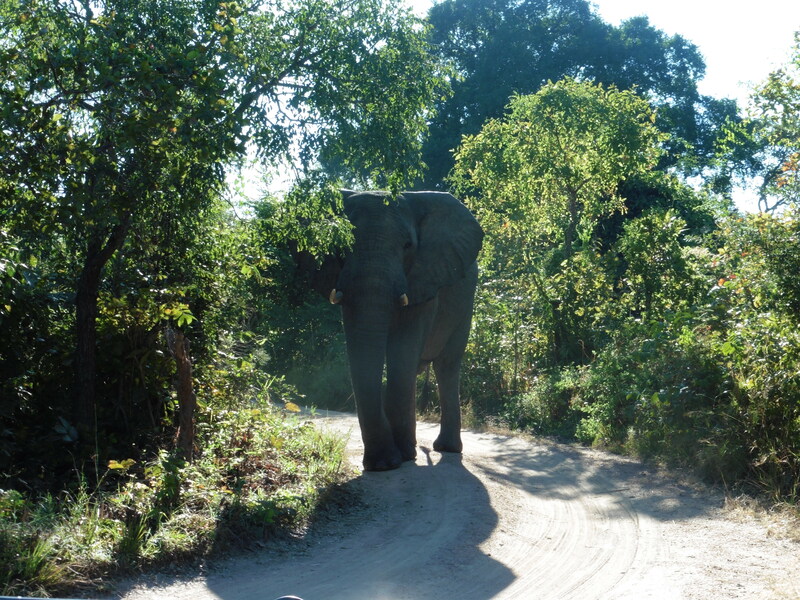 As we were leaving camp this morning, the guides cautioned us to quietly walk to the safari vehicles because an elephant was in the road-right by our tent, as a matter of fact. Two vehicles full of people did not disturb the elephant or cause him to move, so we had to take an alternative road to the airstrip. We flew small planes to Livingstone, Zambia and then boarded a van to cross into Botswana. Long lines of semis were waiting to take the ferry from Zambia to Botswana. Phanuel told us the trucks could wait in line for up to a week. Copper is the number one industry in Zambia. Many of us wanted to buy Zambian copper bracelets as souvenirs before we left the country. 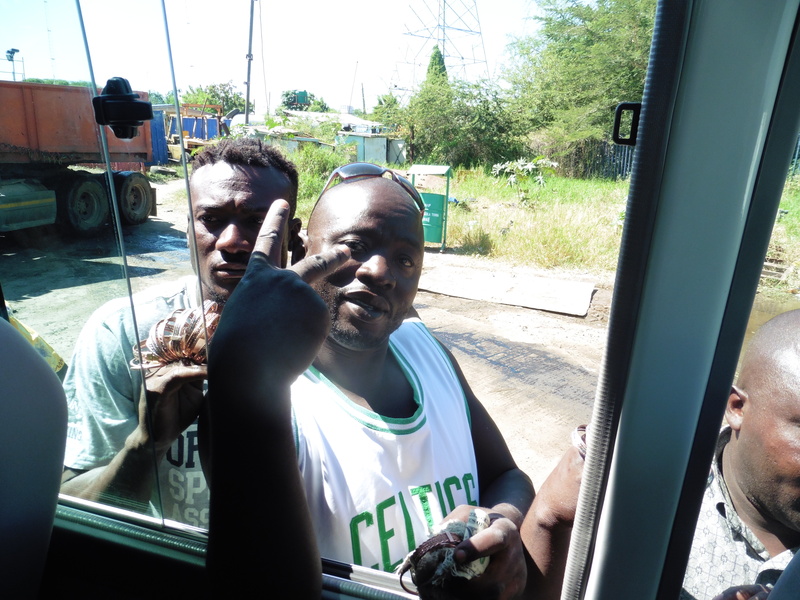 As our van pulled up to immigration, we were surrounded by young men selling copper bracelets and carved animals. We weren’t able to get off the van right away, so we opened the windows and bargained for our bracelets through the window. 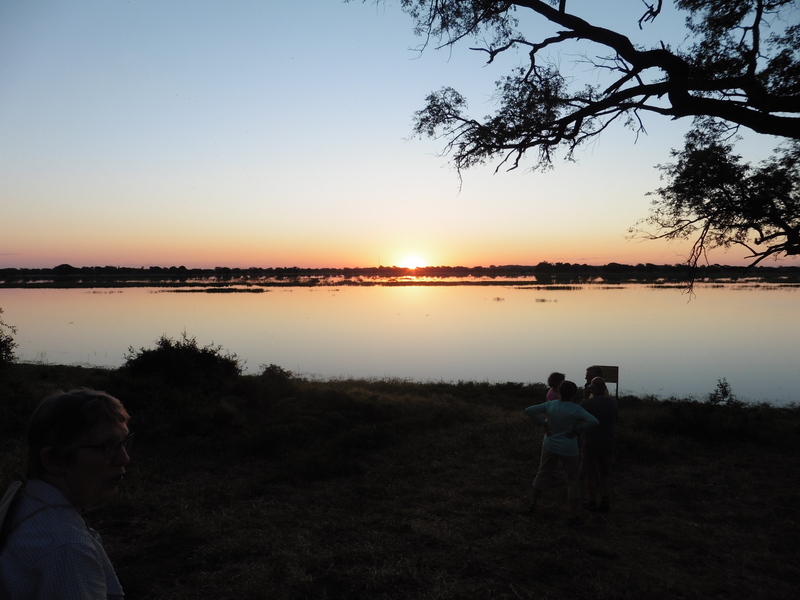 We took a small boat across the Zambezi river and boarded a different van in Botswana. 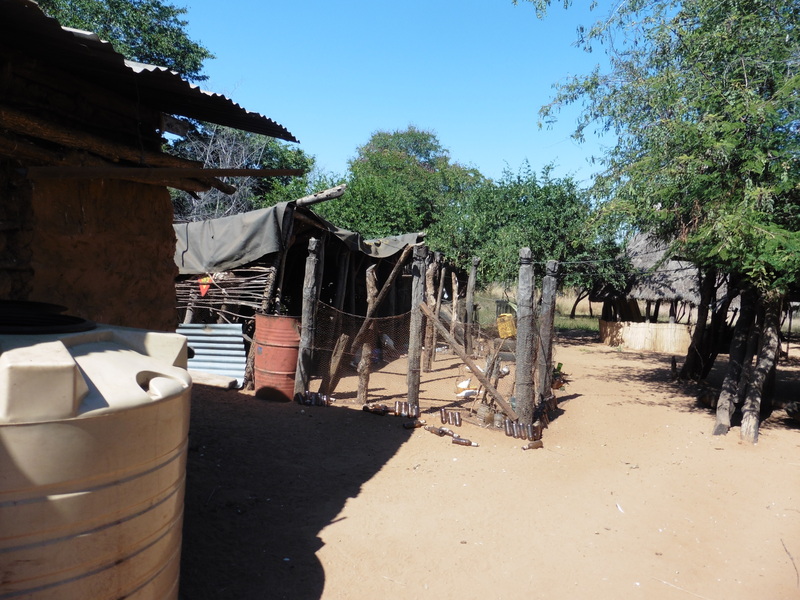 On the way to our next safari camp, we stopped to visit a woman who lived in a small homestead. She had watched our van drive by, so our driver asked her if she would talk with us about how she lived. She greeted each of us and invited us into her home. One of her young sons was home while we were there. Her very limited power comes from a small solar panel and her water comes from a nearby stream. Her family has only enough food for one meal a day which they eat at about 3:00. I was so impressed with how this woman who had so little could smile and laugh and so graciously share her life with us. Mid afternoon we arrived at Baobob Wilderness Camp, our home in Botswana for the next three days. 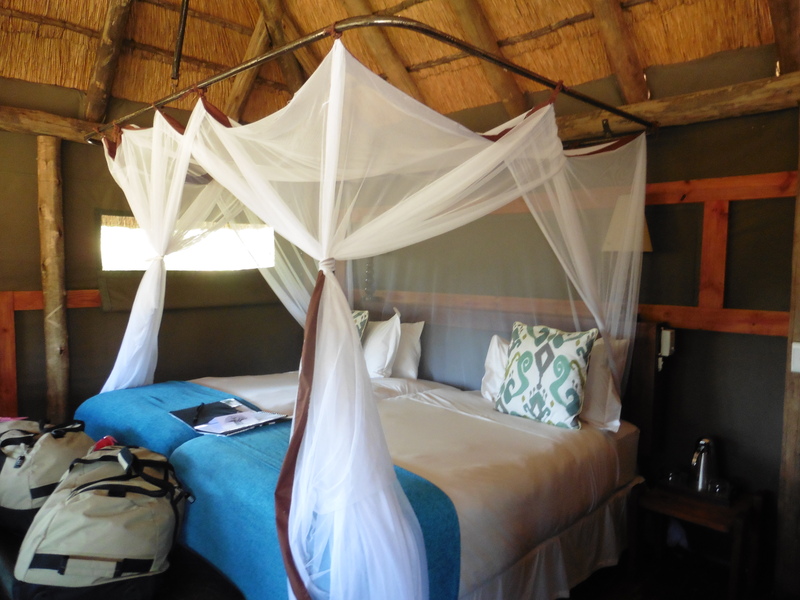 Located on the Chobe river, the camp sits above a flood plain that is a favorite place for wildlife to make their way to the river. 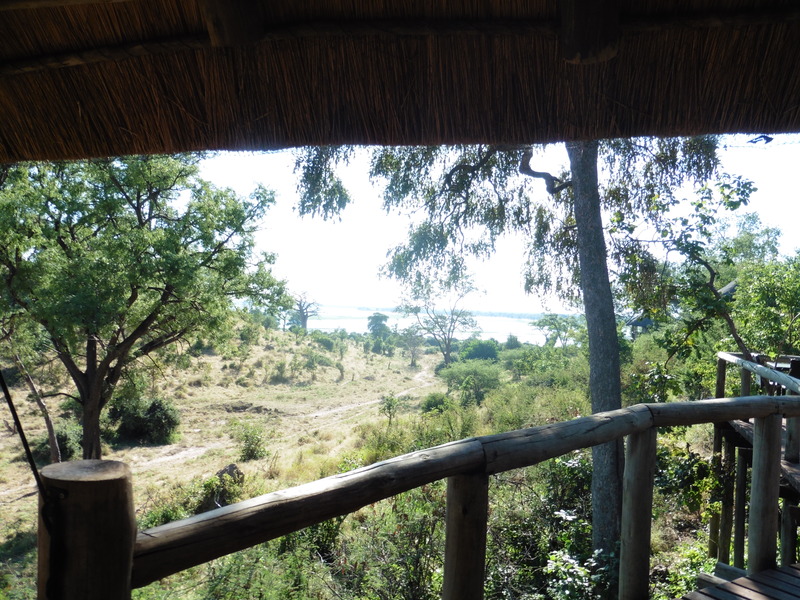 The deck outside our tent gave us a perfect view of the animals coming to and from the river. There is so much wildlife in the area that we were told to pause and listen before leaving our tents to make sure no animals were nearby. We were also told if animals were in the path to stay in our tent and one of the staff would come and get us. After high tea we went on the best safari so far. 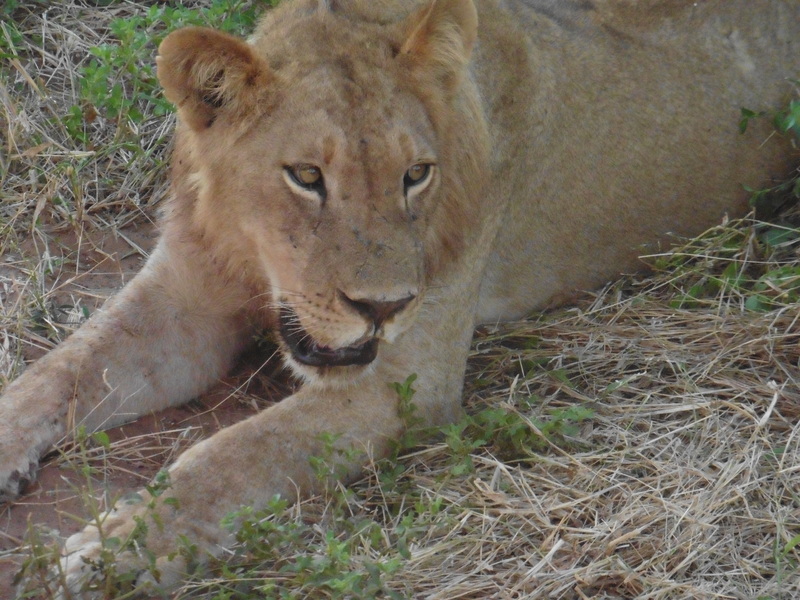 We saw a young male lion who had just eaten so we were able to safely get close to him. We could get close to many of the animals because they see the safari vehicle as one familiar object, not individual people. Then we hit the elephant jackpot. Hundreds of elephants were in route to the river to drink, play and roll in the mud to remove some of the bugs on their hides. A congress of baboons entertained us. 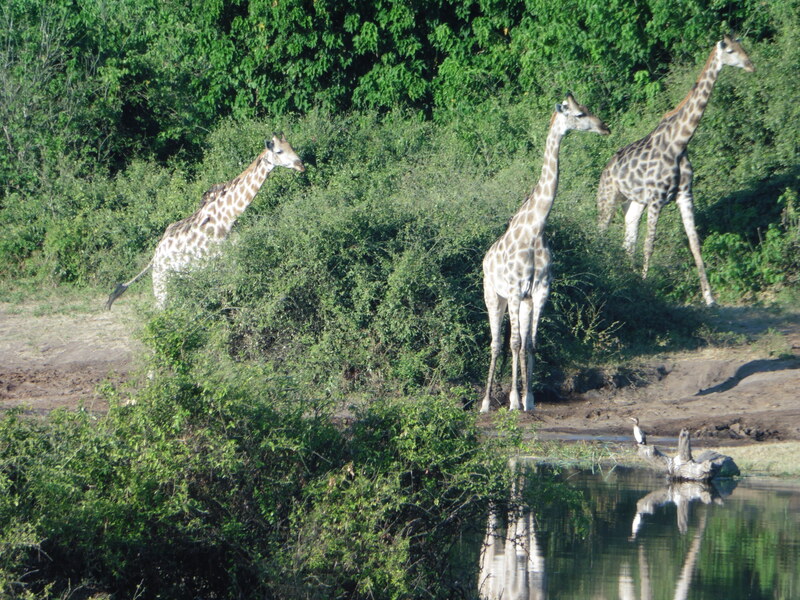 We had our first sighting of giraffes who were grazing and drinking behind the elephants. We were not able to get as close to them because they run away if people get too close. 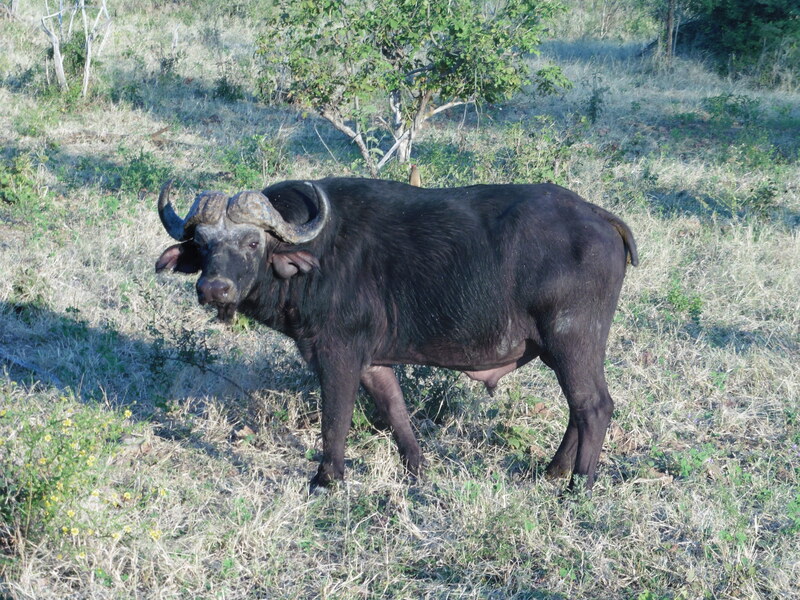 We also had our first cape buffalo sighting. They are one of the “Big Five” animals because they are among the five most difficult and dangerous African animals to hunt on foot. Hard to believe they reportedly kill more hunters than any other African animal because they look a lot like black cows with curved horns. This entry was posted in Africa 2018 on May 1, 2018 by debbie.